Oriental Bay, French Riviera or absolutely positively Wellington? Oriental Bay is often called the Riviera of Wellington and, indeed, there is something of that famous stretch of French coastline about it. There’s a suggestion of Juan Les pins in the sweep of beautiful beach, the pontoon and the pines. There’s a little of Nice’s Promenade des Anglais in the sea wall, the benches and the wide footpath. There’s a touch of St Tropez in the yachts moored at Clyde Quay Marina and the flotilla of white sails out on the harbour. There’s a hint of Cannes, too, in the gleaming white apartment buildings along Oriental Parade. Most of Oriental Bay, however, is absolutely, positively and uniquely Wellington. The Freyberg pool is a local architectural icon as well as a memorial to champion swimmer, World War II General and NZ Governor General Bernard Cyril Freyberg. The Carter Fountain, which plays off shore, wind permitting, four times a day, remembers its donor, prominent Wellingtonian, Hugh Carter, who, tragically, was drowned two days after its inauguration. The Band Rotunda, built in 1936, now a restaurant, is a piece Wellington history, a monument to the days when the Municipal Orchestra entertained holiday crowds. St Gerard’s Monastery, overlooking the bay from high on the cliffs, is an unmissable Wellington landmark. The little wooden houses stoically standing their ground between the 21st century giants and clinging tenaciously to the hillside, are unmistakeably Wellington. The solid white ferries that glide past, on the way to and from the South Island, are a part of every day in the capital and of life in Aotearoa New Zealand. With its beautiful, sunny sheltered beach, amazing architecture, million dollar views and its wealth of cafes and restaurants, Oriental Bay is one of Wellington’s most desirable suburbs and popular city escapes. But it wasn’t always that way. Oriental bay was originally named Duppa, after George Duppa who settled there in 1840. In its early days it was an unprepossessing spot, with a pervasive stench from the blubber boiled up on the narrow rocky beach by sealers and whalers. Later, Duppa renamed it Oriental Bay, after the ship which had brought him to New Zealand. Perhaps he thought that a hint of the exotic East would lure more settlers but for years Duppa lived alone in the miserable little house dubbed Castle Doleful by people of Wellington. His only neighbours were the doctor, the nurse and the handful of inmates in the beachside quarantine tent. Settlers did eventually trickle into Oriental Bay and by the end of the 1800s there was scattering of wooden villas along the beach front and on the hills. In 1908, the Redemptorist Fathers established the first church, St Gerard’s, on the hilltop. Now a respectable, established and god-fearing suburb, the bay attracted more settlers. Development continued apace. Business and houses, bigger and grander, spread along the Parade and up the hillside. In 1932, surrounding and absorbing the church, and dominating the skyline, St Gerard’s Monastery was built. 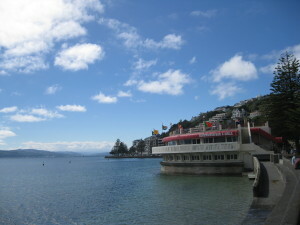 It soon became the crowning feature of Oriental Bay and one of Wellington’s most distinctive landmarks. On Oriental Parade, apartment buildings, shops, restaurants and hotels shouldered in alongside the old wooden villas. Real estate values soared and Oriental Bay began to draw in rich and famous residents. Meanwhile, down by the sea, a different kind of development had been in steady progress. Oriental Bay was becoming a 20th century leisure spot. Te Aro Baths had opened at the turn of the century offering bathing for ladies between 9.00am and 4.00pm and for gentlemen before 9.a.m and after 4p.m. In 1902, the Royal Port Nicholson, Yacht Club moved in, setting up its clubhouse and mooring its boats at Clyde Quay. Soon Oriental Bay was dotted with white sails. Regattas were underway. When, in 1914, the Oriental Bay Tea Kiosk appeared, it was the place to be seen. Then, when the adjoining private hotel was added in 1920, it was the place to stay. 1919 saw the opening of the Band Rotunda, where on Sundays and public holidays, the Municipal Orchestra entertained growing crowds with “good orchestral music”. In 1963, Te Aro Baths were re-born in a modernist building with a butterfly roof and glass walls modelled on Brazilian Oscar Niemeyer’s 1942 Pampulha Yacht Club. It was named the Freyberg Pool after World War II General, ex Governor General and National swimming champion Bernard Cyril Freyberg. In 1973, local resident, Hugh Carter donated the Oriental Bay fountain. When Carter was tragically drowned two days after the launch, it was re-named the Carter Fountain. 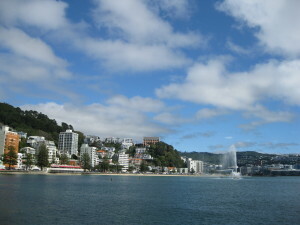 Finally, in 2003, the City Council dumped tonnes of sand from Nelson’s golden sand on the beach at Oriental Bay. The rocky, smelly, lonely bay of George Duppa’s days, was now the Riviera of Wellington.